They ran it back, and Adonis Stevenson ran over Andrzej Fonfara. Some three years after their first fight proved far more competitive than most believed to the case going in, Stevenson scored the blowout win expected of him all along. The defending light heavyweight annihilated Fonfara in less than four minutes of their Showtime-televised main event Saturday evening at Bell Centre in Montreal, Canada. Stevenson floored Fonfara midway through the opening round, and forced the stoppage at 0:28 of round two after Fonfara's trainer, Virgil Hunter climbed the ring apron to rescue his battered charge. The contention all along by the 39-year old Stevenson was that the first fight only lasted the full 12 rounds due to an injury to his left hand. He had Fonfara down and badly hurt in the opening round of their May '14 clash, but not only let him off the hook (literally) but hit the deck himself before recovering to claim a unanimous decision victory. History repeated itself midway through round one of the rematch, when a left hand shot once again sent Fonfara to the canvas early in the night. There would be no valiant comeback this time around, however - not as long as a two-handed Stevenson was prepared to close the show. "My hands were very good for this fight and you saw what happened," insisted Stevenson (29-1, 24KOs) to Showtime's Jim Grey after the bout. "The first fight, sure I did (take Fonfara lightly). But I was very focused on him this time. He’s a very good fighter." He was also a very buzzed fighter. Fonfara barely made it out of the opening round, but not before eating a hailstorm of power punches while trapped in a corner. The bell saved him, but his corner wasn't about to let him take too much more punishment. Head trainer Virgil Hunter wasted no time in getting his boxer's face, insisting that anything short of a complete reversal in momentum would result in a corner stoppage. The veteran trainer remained true to his words. Fonfara was largely unresponsive to no fewer than five more right hands from Stevenson, prompting Hunter to climb the ring apron in requesting that referee Michael Griffin stop the contest at 0:28 of round two. "There was no need to allow the fight to continue," Hunter lamented afterward. "Fonfara was hurt in round one and I told him to throw more punches (in round two). He was badly hurt and there was no need for it to continue." Fonfara suffers his second early knockout loss in the span of less than a year He was on the very wrong end of 2016's Upset of the Year when Joe Smith Jr. starched him inside of a round last June in his adopted hometown of Chicago. This time around, the Polish light heavyweight - who since rebounded with a 10th round knockout of Chad Dawson in March - came in as a massive underdog but was left to pay respect to a dominant victor and still champion. "It was a good stoppage. 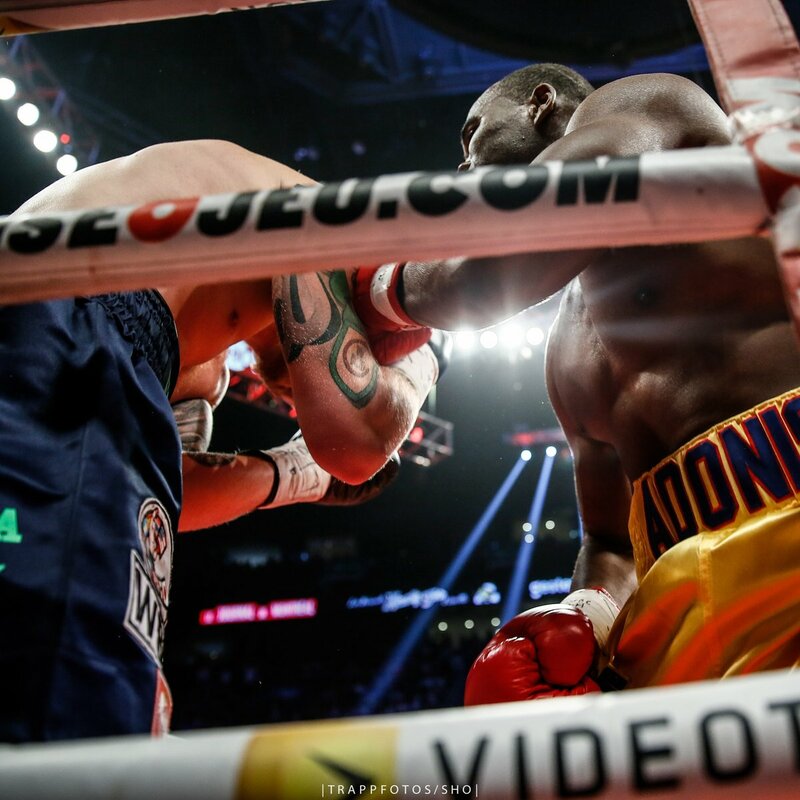 Adonis hurt me," Fonfara acknowledged. "Adonis Stevenson is a great champion." In order to remain one, Stevenson will next have to honor his mandatory obligation. For the Haiti-born, Montreal-bred southpaw, that means meeting up with fellow GYM-promoted light heavyweight Eleider Alvarez, the unbeaten top contender whom outpointed former champ Jean Pascal in the evening's chief support. Such a matchup didn't seem to at all faze the light heavyweight ruler. "I leave the fights to (adviser) Al Haymon," Stevenson said in deflecting any commitment to future plans. "I don't have to call out anybody. Whoever Al Haymon puts in with me, I'm ready baby."